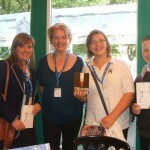 These were my fantastic chairpersons at the Edinburgh International Book Festival – from St Augustine’s School. 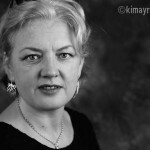 Portrait by Kim Ayres, the artist in residence at the Wigtown Book Festival – he loves faces, all faces. See his work at www.kimayres.co.uk.